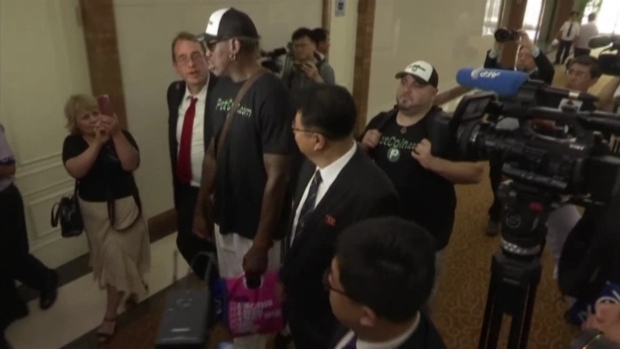 In this Jan. 6, 2014, file photo, former NBA basketball star Dennis Rodman (left) and his entourage arrive at the international airport in Pyongyang, North Korea, where he took a team of former NBA players for an exhibition game on Kim Jong Un's birthday. Former NBA star Dennis Rodman says he'll travel to Singapore "for the historical summit" between President Donald Trump and North Korea's Kim Jong Un. Rodman announced his trip in a tweet Friday, saying, "I'll give whatever support is needed to my friends, @realDonaldTrump and Marshall Kim Jong Un." An earlier version of the tweet, which noted he is being sponsored by a digital currency called PotCoin, was deleted. Rodman's tweet included a photo composite of Rodman, Trump and Kim in front of the flags of both nations and the word "unite." Officials have said Rodman won't play an official role, and Trump's said Rodman wasn't invited. Asked about Rodman on Friday, the president said he had a genius for rebounding during his storied NBA career, in which he won three championships with Michael Jordan's Chicago Bulls and two with the Detroit Pistons. He led the league in rebounds for an unprecedented seven straight seasons. White House spokesman Hogan Gidley told Fox News on Thursday that Rodman is "great on the court but negotiations should best be left to those who are good at it." Rodman is one of the few Westerners to have personally met Kim. He flew to Pyongyang last year for a return trip in hopes the he could "open a door" for Trump to talk to Kim. He advertised for PotCoin on that trip as well.